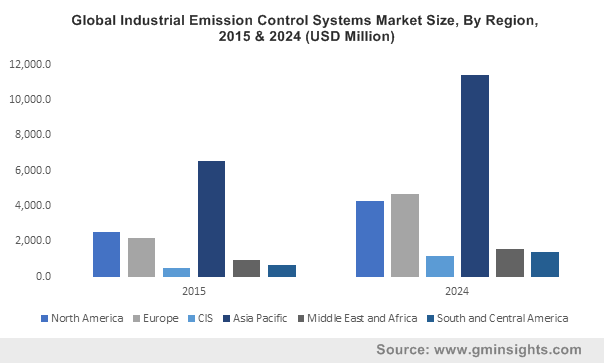 Europe industrial emission control systems market to register significant gains over 2016-2024, Germany to the key revenue contributor « Global Market Insights, Inc. Rising efforts by global regulatory bodies to implement pollution control technologies will expedite Industrial Emission Control Systems Market size over the next few years. Of late, the world has witnessed a tremendous rise in pollution levels and carbon emissions, subject to which the governments of various countries have enforced numerous regulations that need to be followed by power plants, manufacturing firms, and other industries. These companies are now installing emission control technologies to reduce pollution and contribute to saving the environment, which will significantly propel industrial emission control systems industry. The rapid surge of industrialization across regions such as APAC and MEA will lead to an increase in the demand for emission control systems, pertaining to the large presence of power plants and chemical factories. This requirement will help fuel industrial emission control systems market across these regions. These systems help control the emissions of harmful pollutants such as nitrogen oxide compounds, Sulphur oxide compounds, and volatile organic compounds, and find huge applications across the chemical & petrochemical, metal, cement, manufacturing, and power generation sectors. Undoubtedly, power plants are a major source of pollutant emissions – harmful gases, solid toxic particulates, acidic streams, and vapors emitted from these plants have harmed the global environment to no end. Subject to the restrictions mandated by the government regarding pollutant emissions, these plants are increasingly deploying emission control systems at their worksites. Industrial emission control systems industry size from power plant applications was worth more than USD 5 billion in 2015 and is anticipated to grow at a CAGR of 6% over 2016-2024. In a bid to meet the growing demands for electricity, China has established numerous power plants across the country, subject to which the demand for emission control systems in the region is significantly high, especially from power generation companies. China industrial emission control systems market size from power plants may cross USD 1 billion by 2024, pertaining to the rapid industrialization and growing requirement for electricity. Electrostatic precipitators, one of most prominent devices of industrial emission control systems industry, are used to thoroughly remove solid pollutant particulates. They are widely deployed across the power generation, chemical, and steel sectors, owing to which Electrostatic Precipitator Market is anticipated to earn a significant revenue over the next few years, subject to their superior properties. Industrial emission control systems industry size from electrostatic precipitators will observe a CAGR of 6% over 2016-2024. These devices are heavily implemented in Germany, especially across the growing manufacturing sector of the country, to absorb pollutants and control carbon emissions. Subject to this factor, Germany industrial emission control systems market size from electrostatic precipitators was worth USD 242.88 million in 2015, and is projected to grow at a rate of 7% over 2016-2024. Germany will be a key contributor toward Europe industrial emission control systems industry share, and will register a notable CAGR of 8% over 2016 to 2024. France industrial emission control systems market will also contribute significantly toward the regional growth, and will register a CAGR of more than 9% over 2016-2024, owing to the vast number of power projects and high economic growth of the region. Spain and Italy are touted to be other regional contributors. Having held a share of more than 15% of the overall industrial emission control systems industry, absorbers are used to remove heavily toxic gases. These devices are heavily deployed across chemical factories, which will impel industrial emission control systems market share from chemical & petrochemical applications. Companies have been striving to integrate these devices with high grade technology to reduce its cost and improve its efficiency. Subject to this factor, industrial emission control systems industry from absorbers will surpass a revenue of more than USD 4 billion by 2024, growing at an annual growth rate of more than 8% over 2016-2024. Absorbers are deployed across the cement sector as well, subject to their superior toxic pollutant removal properties. Industrial emission control systems market size from cement applications was worth more than USD 1.5 billion in 2015 and is projected to observe a heavy growth, owing to the rapidly developing construction sector across the globe. Additionally, these systems are particularly in demand across China, subject to the development of the construction sector in the region and favorable norms regarding emissions, which will impel China industrial emission control systems industry from cement applications. Scrubbers help wash away the toxic Sulphur oxide compounds from wet & dry flue gas desulfurization plants. Having held more than 15% of the overall industrial emission control systems market share in 2015, scrubbers will be in high demand across the MEA region. Bearing testimony to this fact are the following statistics – Saudi Arabia industrial emission control systems industry share from scrubbers was USD 44.01 million in 2015, and it is expected to grow at a CAGR of 5.3% over 2016-2024. Similarly, Belarus industrial emission control systems market size from scrubbers is expected to cross USD 40 million by 2024, with a y-o-y growth rate of 11% over 2016-2024. The rapid expansion of the industrial sector coupled with the increasing number of power plants will expedite the growth in these regions. Catalytic systems, another critical product of industrial emission control systems industry find applications across the oil & gas sectors and are predicted to cross revenue of more than USD 6 billion by 2024. High demand from oil refineries and petrochemical factories will also foster the growth of Stationary Catalytic Systems Market, anticipated to grow at a CAGR of 6% over 2016-2024. Industrial emission control systems industry size from metal applications was worth more than USD 1 billion in 2015 and will observe gains of more than 8% over 2016-2024, subject to the product’s widespread usage for absorbing metal fumes and toxic gases. Brazil, one of the key emerging economies, has been observing surge in its oil & gas exploration and mining activities. Subject to this fact, Brazil industrial emission control systems market will grow remarkably at a CAGR of 8% over the years ahead. Chile, another prominent region of South America industrial emission control systems industry, will also cross a valuation of USD 200 million by 2024. The United States will witness a huge demand for all the products of industrial emission control systems market, owing to the fact that the region has observed a consistent growth across the power, cement, metal, and chemicals sectors. In addition, the presence of a vast number of market players and their efforts to innovate new technologies to reduce emissions will boost U.S. industrial emission control systems industry share, which is anticipated to cross a valuation of more than USD 2 billion by 2024. Subject to the rising construction sector in the region, the cement factories here heavily demand the deployment of absorbers. Pertaining to this factor, U.S. industrial emission control systems market share from absorbers was more than USD 250 million in 2015, and is expected to grow at a rate of 7% over 2016-2024. Major companies have been engaging in growth strategies to research and develop highly advanced, technologically innovative, and extremely efficient emission control systems. Key participants operating in global industrial emission control systems industry include Mitsubishi Hitachi Power Systems, Fujian Longking Co., Ducon Technologies, Babcock & Wilcox Enterprises, Thermax Ltd., BASF, Auburn Systems, General Electric Company, Johnson Matthey, Hamon Corporation, CECO Environmental Corp., Amec Foster Wheeler, APC Technologies, and Air Clean LLC. This entry was posted in ENERGY, MINING, OIL AND GAS and tagged Industrial Emission Control Systems Industry, Industrial Emission Control Systems Manufacturers, Industrial Emission Control Systems Market Analysis, Industrial Emission Control Systems Market Growth, Industrial Emission Control Systems Market pdf, Industrial Emission Control Systems Market Report, Industrial Emission Control Systems Market Trends, Systems Market Price.